ORLANDO, FL--(Marketwired - October 15, 2013) - Southwest Airlines Vacations is offering travelers savings of up to $100 when booking vacation packages to Arizona. With a skyline framed by rugged mountains and a landscape that shifts from cactus-dotted desert to green and lush oasis, Arizona is one of the country's most unique destinations. Travelers who book a flight plus hotel vacation package to Arizona with Southwest Vacations, will save up to $100 ($20 per night) when using the promotion code ARZ100 at the time of booking. Travelers can make the most of their Arizona vacation by bundling add-ons like hot air balloon rides, desert tours, and other activities to make a complete package. 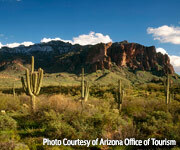 Plus, they can make transportation around Arizona a breeze by adding a rental car to the vacation package. To take advantage of this Arizona vacation deal, travelers must book their packages between October 15, 2013 and November 4, 2013 by 6:00 p.m. Central Time for travel October 16, 2013 through March 31, 2014. One-day advance purchase is required. Phoenix -- Experience a wonderful mix of Native American history and modern day attractions, and enjoy the beautiful weather and picturesque desert landscapes. Scottsdale -- Find new challenges on the well-manicured championship golf courses of Scottsdale, and take in the unique scenery during the game. Mesa -- Outdoor lovers will find plenty to explore with a hiking adventure or a cool relaxing float down the Salt River in Mesa. Tempe -- When the sun goes down, head to Mill Avenue in Tempe to experience a thriving nightlife that hosts plenty of live music, theater, and entertainment. Sedona -- Explore the diverse history, archaeology, and arts of Sedona all against the red rock backdrop of some of the most amazing natural rocks in the country. Customized vacation packages include roundtrip flight via Southwest Airlines® to Phoenix and hotel accommodations (including taxes). Plus, first and second checked Bags Fly Free®-savings of up to $120 per person, roundtrip. † Even Golf Bags Fly FreeSM. Visit the Benefits of Booking a Southwest Vacation page to learn more about everything included in a customized vacation package. Up to $100 ($20 per night with a maximum of five nights) per reservation promotion code savings apply on flight plus Arizona hotel vacation packages. Savings is reflected in the package price when using promotion code ARZ100 at the time of booking. Length of stay for flight and hotel components must match. Promotion code intended for redemption by individual consumer only. Savings valid if booked October 15, 2013 through November 4, 2013 by 6:00 p.m. CT for travel October 16, 2013 through March 31, 2014. Flight service for all of the destinations listed above is into Phoenix.